As a young child in a Siberian orphanage, Sofi Collis dreamed of a life in America. The fourth grader from Arizona reflected on her dream when she wrote the winning essay in a nationwide contest to name the two Mars rovers, Spirit and Opportunity. In the contest sponsored by NASA, The Planetary Society, and LEGO, her 50-word essay was chosen from over 10,000 entries. 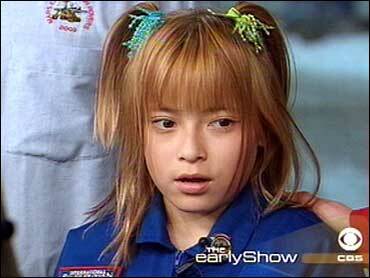 On The Early Show, Sofi read her essay, "I used to live in an orphanage. It was dark and cold and lonely. At night i would look up and see the sky and I felt better. Thank you for the spirit and opportunity." Asked how she came up with the names Spirit and Opportunity, she tells co-anchor Hannah Storm, "Well, you couldn't really do anything at the orphanage. And when you come to America, you can do whatever you want to do and be whatever you want to, and that was spirit and opportunity." Dave Lavery, a program executive at NASA, says her essay clearly stood out from the rest. He points out, "Almost 10,000 we had submitted, layer after layer of reviews. As they read it, without knowing Sofi's background, they were struck by actually the names. They just fit so well to begin with. But also talking about what the country is all about. What America can offer and especially what it can mean to children, who are growing up and want to get excited about science and technology and, most importantly exploration. It spoke to us." Sofi had the opportunity to go to NASA and see the launch of Spirit. She says, "I was excited." And since she is studying Mars in school, she says she has been telling her friends "that there's probably life on Mars, and water." Actually, Lavery says, "The images you're seeing right now from the Opportunity site, for a Mars geologist, this is the Holy Grail. This is what we were after that tells us what the surface of mars really is like, just under the soil, and really can tell us the context and the history of the place." Asked about the status of Spirit, he says, "We're well on the road to recovery with Spirit and at the point we're probably about a week or so away from resuming full operations with her." Sofi says she wants to be an astronaut when she grows up.